Construction and remodeling markets are booming across the country, and NWFA members are optimistic that demand for wood flooring will remain strong going into 2019. More than two-thirds of respondents – including manufacturers, distributors, retailers, and contractors – expect sales growth of at least 3 percent in 2019, with 22 percent expecting sales will grow significantly (8 percent or more). 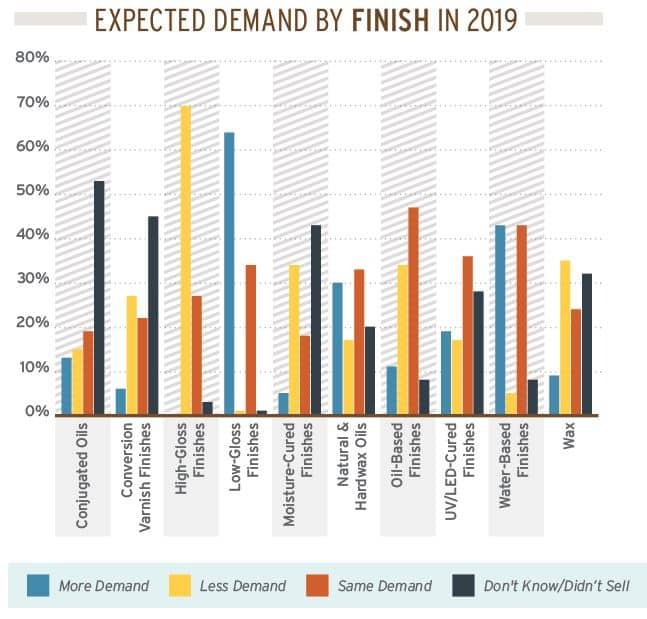 That’s coming off a strong year in 2017 for NWFA members, most of whom said sales of their wood flooring products grew, according to NWFA’s 2019 Industry Outlook survey. Halfway through 2018, most survey respondents were optimistic they’d end the year up. National forecasts echo NWFA member sentiments, citing consumer confidence as one driver of demand. The Leading Indicator of Remodeling Activity (LIRA), published by the Joint Center for Housing Studies of Harvard University, projects annual growth in homeowner remodeling expenditures may “taper somewhat” in the first half of 2019 but remain at a healthy 7 percent. The center expects annual spending on residential improvements and repairs by homeowners to reach nearly $350 billion by the middle of 2019. The National Association of Home Builders (NAHB) Remodeling Market Index (RMI) posted a reading of 58 in the second quarter 2018, up from the previous quarter; readings above 50 indicate more remodelers report positive market activity than not. NAHB also expects consumer demand for single-family housing to grow as the overall economy and labor market strengthen. The American Institute for Architects’ (AIA) Consensus Construction Forecast predicts 4.7 percent growth in nonresidential construction spending for the full year 2018 and 4 percent in 2019. If that pans out, it will result in nine years of consecutive growth, according to AIA, which also noted that total spending on nonresidential buildings would be 5 percent greater than the last market peak. The current market growth is unsustainable. The labor shortage is making it difficult to meet growing demand. Continuing price fluctuation from manufacturers, due to raw materials inflation, and concerns over potential tariffs. According to the U.S. Department of Labor, the prices of steel, aluminum, lumber, and plywood are all up by double digits. The upcoming midterm elections are also giving some members pause, as they wonder what the elections’ impact will be on consumers’ desire to move forward on major projects. “People pull back a little bit whenever they go through that,” said David Williams of Horizon Forest Products, a distributor. “They want to wait and see what happens. My sense is that’s going to be part of the reasoning that we might see a little softening going into next year.” Building permit figures halfway through the summer indicated a potential softening in housing production, but that is from already-high numbers compared with 2017, according to the NAHB. The remodeling market is facing similar challenges: “Remodelers have to deal with rising material prices, especially lumber, and the continued shortage of labor to keep prices competitive. The labor shortage is also a factor contributing to the increasing backlog of remodeling jobs,” according to NAHB’s remodeling report. NWFA members said white oak will continue to be the go-to species in 2019. Some respondents said this is in large part due to its wide availability, as countries like China have become better at sourcing it and manufacturing it relatively cheaply. Factory-finished and engineered flooring are expected to continue to grow in demand in 2019, as well. On the color front, about 38 percent expect gray stains and finishes, as well as lighter colors, to be in higher demand in 2019; about half expect demand for these shades to be the same as they are now. Low-gloss and scraped finishes are popular, some members said; in part, this is due to not showing the same wear and tear as a high-gloss finish. One respondent said that finishes that make the floor appear to be raw wood are increasing in popularity. 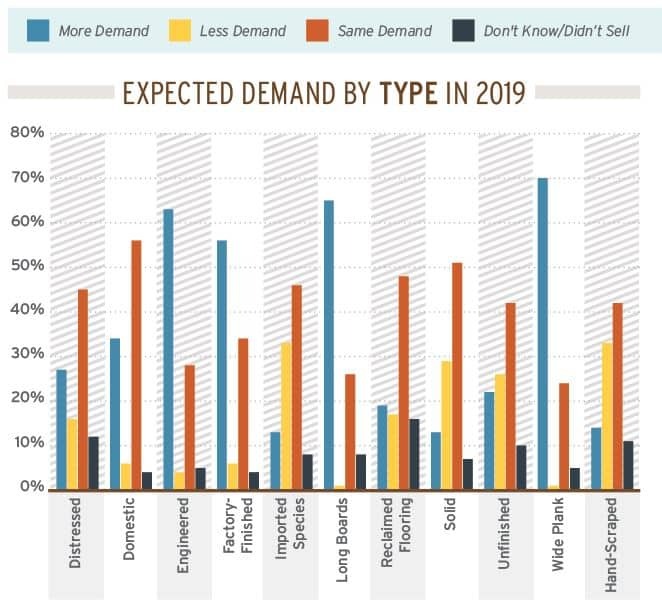 Demand for bamboo continues to decrease, with 65 percent of respondents expecting less demand in 2019. Cork and high-gloss or moisture-cured finishes also were expected to be lower in demand. “Exotics have fallen out of style due to pricing and poor availability in some markets,” according to one respondent. On top of these concerns, growing demand for resilient non-wood/wood-look floor coverings such as LVT, laminate, WPC, and tile are taking market share from NWFA members. Contractors in the survey named LVT and laminate as the biggest threat to wood flooring. Half of survey-takers said that non-wood/wood-look floor coverings have had a negative impact on their real wood product sales. Another 17 percent were unsure. “Everyone is trying to copy the wood look,” said Jim Gould, founder of the Floor Covering Institute, adding that the quality has improved, which has made LVT and other competing non-wood products a much bigger threat to NWFA members. He also said that there are no rules around marketing these products, and that some brands are misleading consumers. NWFA members continued to report difficulty in finding skilled labor at every stage of the supply chain. However, contractors seem to be having the most trouble, with nearly 70 percent saying they are having problems finding the right people. “Everybody’s struggling to find help at this point, but that’s what happens. Things gear up, and the labor is just not there, especially in our business,” Williams said. He said he’s having trouble finding talent for his distribution business, even for positions that don’t require strong technical expertise. “For us, it’s really looking out and trying to find people that are already working,” he said of their strategy. More manufacturers said they expect to raise prices in 2019 than did in the 2018 NWFA outlook. 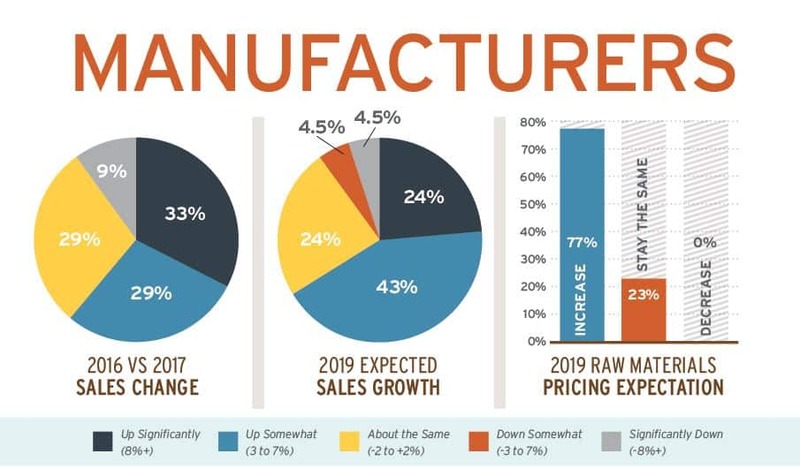 About 55 percent of manufacturers said they plan to increase pricing three percent or more in 2019 (compared with 37 percent that said the same in 2018). Another 45 percent plan to keep pricing about the same. The jump is due in large part to the expectation that raw materials pricing will go up; 77 percent said they expect increases in raw materials costs. Members also noted that the cost of freight is putting pressure on margins. Once again, NWFA members are struggling to sustain adequate margins as they compete against liquidators, big-box stores, and cheaper imports. And, as noted last year, some members say competition from wood-look products is also driving pricing down in some categories of wood flooring. But very few NWFA members surveyed mentioned online competition as a contributor to commodity-level prices. Another wrote that sometimes the information is just not specific enough to that buyer’s needs. “Most of the information out there is not specific enough to the area in which we live.” And consumers tend to think they know more than they do, considering how infrequently they buy the products they are seeking from NWFA members, said another. “They are not immersed in all the variables that make for either superior or inferior items. 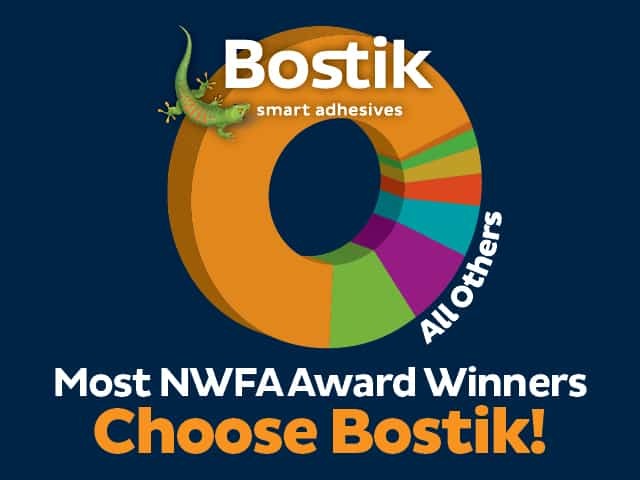 Nearly 45 percent of NWFA contractors – the greatest percentage of the four groups surveyed – saw significant sales growth (more than 8 percent) in 2017, and another 41 percent saw sales increase somewhat (3-7 percent). 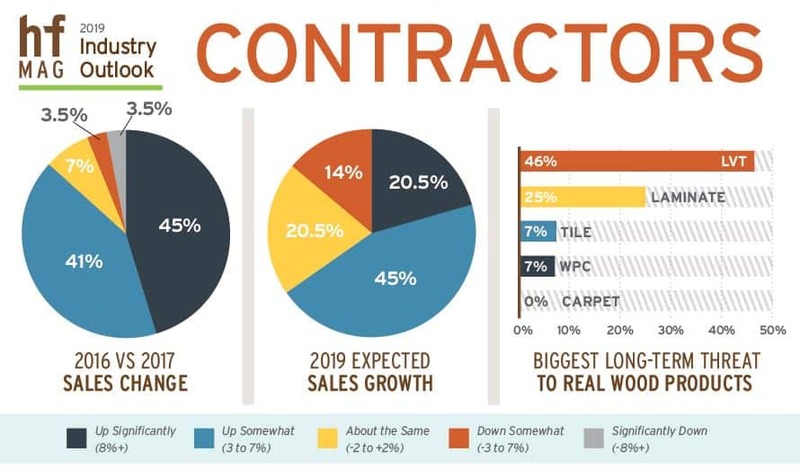 In 2019, two-thirds of contractors expect wood flooring sales to continue to grow by at least three percent. All of the contractors in the survey said they installed wood purchased from wood flooring distributors in 2017. Just three percent said they installed flooring bought through online-only sources, though 41 percent said the client provided the wood. The most common cut of flooring was plainsawn (90 percent), and the most common installation method in 2017 among those who answered the survey was nail down over wood subfloors. Water-based finishes were most common, used by 50 percent of respondents, followed by oil-modified finishes, used by about a third. Contractors are optimistic for the next year, hoping to ride the booming construction and remodeling markets. Top opportunities going into the second half of 2018 and into 2019 include expanding in prefinished flooring and other flooring surfaces; establishing new lines of business, such as flooring maintenance programs; selling more high-end products; and raising prices. Others are looking to work with new customer types, such as architects and designers. About two-thirds of NWFA manufacturers saw wood flooring products sales grow in 2017. A third experienced growth of 8 percent or more, and another 29 percent said sales were up 3-7 percent. Manufacturers are optimistic about 2019, with about 43 percent expecting modest growth (3-7 percent) and a quarter forecasting significant growth (more than 8 percent). Few expect declines. More than 80 percent of manufacturers saw raw material prices increase in the first half of 2018, significantly more than the 30 percent who said the same last year at this time. Increases were seen in red and white oak, walnut, hickory, cherry, maple, ash, packaging, and freight. No manufacturers said raw material prices fell, and just 18 percent said they remained the same. Despite ongoing pressures from lower in the supply chain to keep pricing lower, more than half of manufacturers said they increased prices in the first half of 2018, more than last year, and nearly half have kept prices the same. No one lowered prices. Inflation is expected to continue in 2019, with more than half expecting to increase prices in 2019. Some of those price increases are connected to tariffs enacted on various raw materials, or in response to the possibility of tariffs, which has introduced some uncertainty into manufacturers’ forecasts for 2019. Government regulation and non-wood floor covering competition from laminate, LVT, and WPC topped manufacturers’ main concerns for 2019, followed by the economy and the political climate. 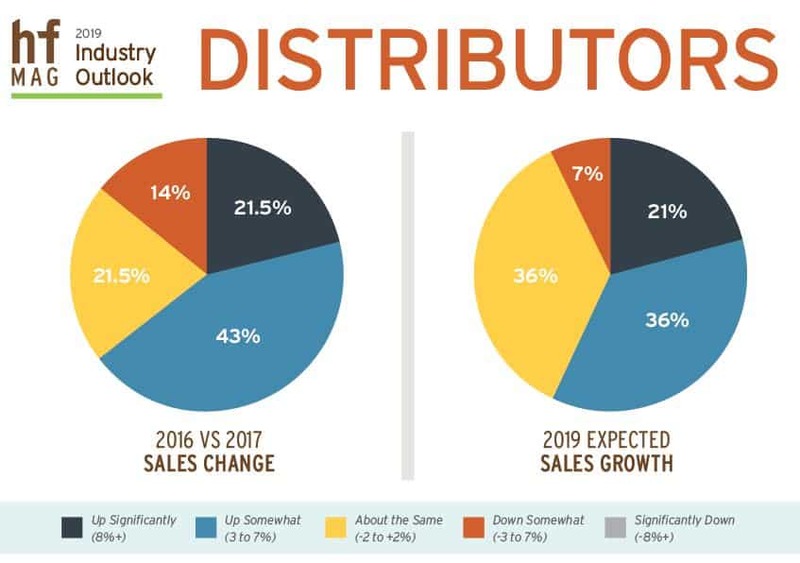 Two-thirds of NWFA distributors saw sales increases in 2017, according to the 2019 Industry Outlook survey. 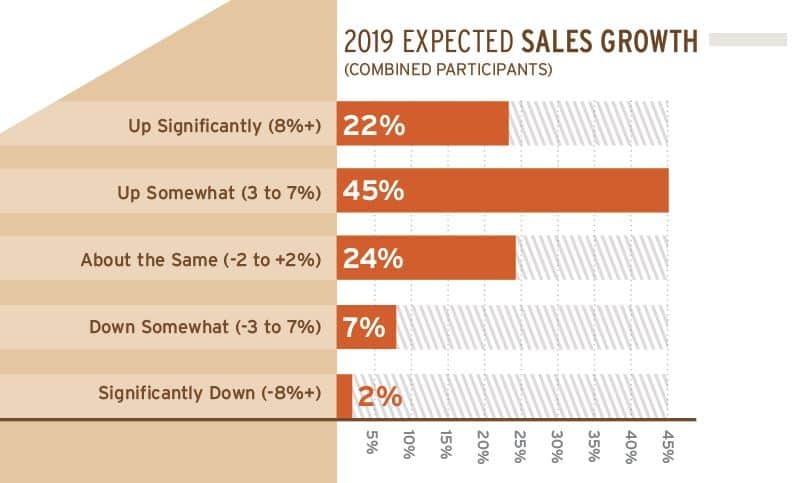 About 57 percent expect sales growth in 2019 of at least 3 percent. Accessories, however, make up a much bigger percentage of distributors’ top lines, with a little less than a third saying accessories are between 11 percent and 25 percent of revenues. Distributors expect their 2019 accessories sales to be consistent with 2018. Much like last year, uncertainty about the economy and manufacturers selling direct were top-of-mind for distributors looking to 2019. “Two of our existing (sampled) manufacturers have removed their products from distributors and are going direct this year,” a distributor said. Competition from wood-look and non-wood floor coverings was also a top concern. Nearly two-thirds of distributors said that wood flooring sales are growing more slowly than non-wood/wood-look sales. “LVT is taking a lot of market share,” said one distributor. Pricing competition is a top challenge, as always. “Small ‘wholesalers’ are driving pricing down on all commodity flooring and accessories,” wrote one in the survey, “just to take share.” Another said they are facing “issues with other distributors selling products at or below cost to steal business.” In response to pricing pressures, distributors currently offering private-label products plan to increase or keep volume the same for those offerings in 2019. Other opportunities for 2019 include selling more high-end flooring, working more with designers that are less focused on price, and selling more prefinished flooring. About 80 percent of NWFA retailers reported either modest or significant growth in 2017. A similar number expect growth of at least 3 percent in 2019, with a fifth looking forward to more than 8 percent growth. Services – including installations, refinishing, design, repair, and training – accounted for up to half of 2017 sales for most retailers, and most survey respondents expect this percentage to stay the same in 2019. Retailers also expect accessories sales, which made up less than 10 percent of 2017 sales for most, to hold steady in 2019. 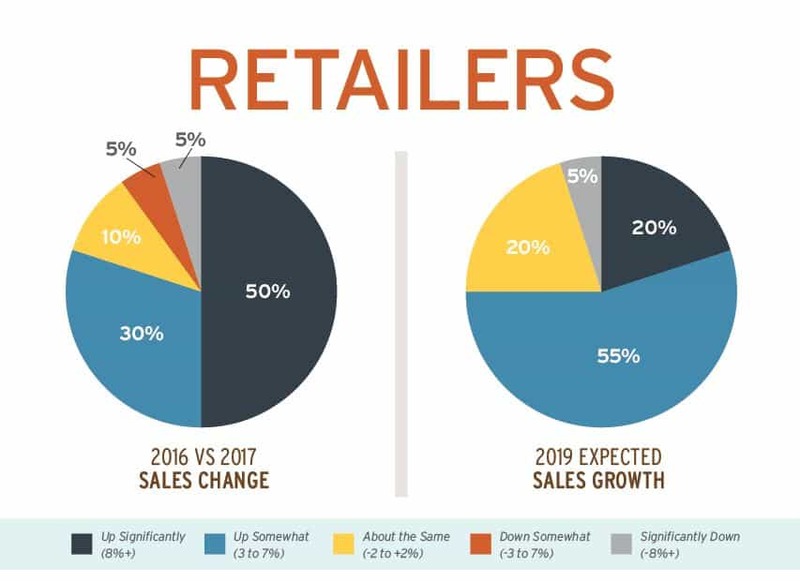 Just as with distributors, private-label sales are expected to grow in importance in 2019 for a little less than half of the retailers in the survey. More than half of retailers said they face challenges in educating consumers on the differences between floor covering products and materials. “Customers buy our products infrequently and are not immersed in all the variables that make for either superior or inferior items,” wrote one retailer. In response, retailers said they are focused on better staff training, hiring more specialists, and positioning themselves with “proprietary products and stellar service,” while avoiding the price-driven parts of the market in 2019. While optimistic about ongoing growth into 2019, the industry probably “won’t get back to the 2008 bubble,” said Gould. Overall, most members who responded to the NWFA survey expect positive results, despite some uncertainty. But in response to challenges, they are adjusting product lines to ensure ongoing profitability in line with consumer demand. For some, that means more engineered or prefinished flooring, or adding some non-wood and wood-look product to their mix. And for others, it just means their previous strategy of going high-end has been reaffirmed. Lindsay Konzak is a researcher with 3 Aspens Media, an industrial and construction markets-focused content production and marketing firm. 3 Aspens Media partnered with NWFA to survey its members and produce the 2019 Outlook report. Learn more about 3 Aspens Media at 3aspensmedia.com. Wonderful report! Thank you for taking the time and sharing! Great insights.